Day two of the ITU World Triathlon Grand Final featured the second Age-Group race of the week. Following Wednesday's Aquathlon World Championships (click HERE for more on that), Thursday was the Sprint Distance World Championships. This, for the fist time for Age-Groupers at World level, was over the draft-legal format. 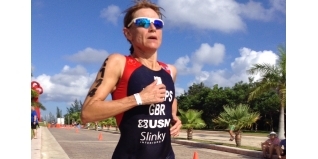 Here is our roundup of GB Age-Group medals at the ITU Sprint Triathlon World Championships. First up we have to mention Michael Smallwood (70-74). After winning the Aquathlon yesterday (by four minutes), he was back on Thursday where he also comprehensively thrashed his opposition once again, this time by three and a half minutes. Thinking it was an easy win, less competitive age-group? Forget that, his time would have won the M65-69 division too. With European Championship titles this season at Aquathlon, Duathlon and Triathlon, and now World Championship Gold at Aquathlon and Triathlon, he can now put his feet up... well, no, he's going to try and win the Standard distance on Sunday too! Don't bet against him. Our second of three Gold medal winners was Jacqui Phillips (45-49). We highlighted Jacqui earlier in the season ("Jacqui Phillips targets Cozumel Gold"), and she duly won her 12th ETU/ITU Championship medal. Historically weakest on the swim, she set up her day by exiting the water in third and then building a lead which nobody could catch her. Barbara Holmes (like Jacqui, also coached by former AG World Champion Nick Dunn of Tri Camp) earned the third GB Gold, to step up one place from her European Championship Silver in Lisbon. Also of note, Silver medallist Liz Dunlop (60-64) was - like Mike Smallwood - a double medallist in Cozumel. She also won Silver yesterday in the Aquathlon. The fastest GB Male AG athlete overall was James Hodgson (7th, 20-24), while the quickest British Female was Brittany Tate en route to Silver in the 20-24 division.